The average tax refund for an American taxpayer is about $3,000. And if you’re one of those getting a refund from your latest tax return, you may already have a concrete plan for what you’ll do with the windfall. According to a survey from the National Retail Federation, nearly half of Americans will put some of their money into savings, while more than one-third will pay down debt. Others may be fantasizing about a less responsible — but more enjoyable — use for that money: Buy a new wardrobe, throw a party for your friends, or finally book that trip to Paris to walk alongside the Champ de Mars towards the Eiffel Tower, baguette in hand. Still, if fat tax refunds have become an annual tradition for you, then you’ve probably heard that you need to change your withholding. That way, say the personal finance experts, you can sock away more money throughout the year into savings, and stop giving the government an interest-free loan every year. Economics is not the primary driver behind financial wellbeing — emotion is, says financial advisor Tim Maurer, author of the book “Simple Money.” Some financial advisors will tell you to remove your emotions from your financial decision-making because they tend to lead to suboptimal decisions. Maurer thinks you’re better off if you can “acknowledge them, recognize them, and plan with them in mind,” he says. In this case, if you know you’re more likely to save that big annual refund once a year than to sock away a little from each paycheck, “then by all means, keep your withholdings at wherever they need to be,” he says. This decision is best made with a hefty dose of self-awareness. Here are a few questions to ask yourself. Do you use your refunds proactively or reactively? If you habitually receive a refund, how do you use the money? If you save it, by making an IRA contribution or adding it to your HSA or 529, you’re being proactive. If you’re paying down the debt you’ve usually accumulated by this time of year, you’re being reactive. “One of the reasons people like getting a refund is because their spending at the end of the year tends to bloat a little,” says Maurer. “They’re in debt [from the holidays] and need the refund to pay it off.” But it’s important to remember that a refund is neither found nor free money — this thinking can lead to the formation of not-so-great habits, like spending more than you should or spending it on things that you shouldn’t. If you’re consistently banking on your refund to bail you out of credit card debt, for example, then the habit of going overboard during the holidays is something that needs to be addressed. How would you feel if you had to write a check to the IRS? The idea of netting more per paycheck by reducing your withholding is an appealing one. What happens if you overdo it and wind up owing the government money? If the thought is already giving you anxiety, then listen to it, says Maurer. “How much is someone actually saving in order to placate themselves emotionally? If it works for someone to receive a higher refund… then that’s fine.” If you absolutely hate the idea of having to write Uncle Sam a check every year at tax time, then it’s fine to keep your withholding where it is. Do you handle small vs. large windfalls differently? If you’re not sure of your track record on this, think about the last time you got a raise. Did you increase your savings or just your spending? If getting that small bump in salary usually just leads to you spending more money — but big windfalls like bonuses or refunds wind up going toward savings or debt — then you’re better off sticking with the refund than increasing your paycheck. Financial behaviorist Jacquette M. Timmons explains that we treat small sums of money differently than we treat large ones. “We have a tendency to discount small amounts and not really appreciate how those small amounts accumulate and grow. Even saving $2.74 a day for a year, adds up to a $1000,” she notes. 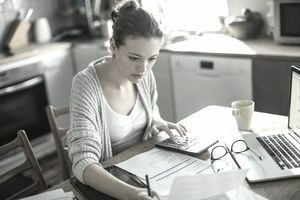 “With large sums, you tend to think more of them, and do more with them.” The key, if you decide to adjust your withholding to get more in each paycheck, is to simultaneously adjust how much you’re automatically contributing to savings. “You have to implement that plan immediately,” says Timmons. “That’s the key.” Otherwise, you are likely to waste it. Do you have short- and long-term financial goals?